Eden is a long sleeved leotard with a large keyhole back, high neckline and stud fastening. High neckline with stud fastening. Nylon Lycra, cotton Lycra or velvet Lycra. 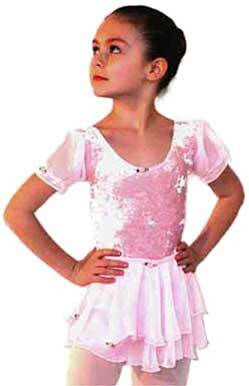 Arisha is a princess seamed leotard with a square neckline, low back and cap sleeves. 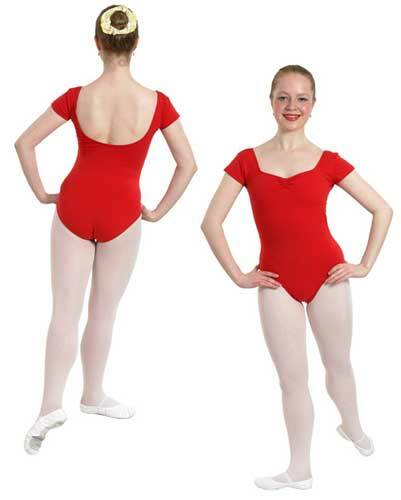 Posy leotard has a ruched v-neck front and back with 3/4 length sleeves. Jessy leotard is nylon with chiffon sleeves, and is scooped front and back. Jessy skirt is a single layer of chiffon, wrap over style with an elasticated waist. Calao is a cross-over leotard. Anouska leotard has a square neckline at the back and 3/4 length sleeves. Anouska leotard has a square neckline at the back and cap sleeves. Bahia is a plain long sleeved leotard with a high neckline and front zip. Oasis is an asymetric leotard with a chiffon sleeve. Jessica leotard has chiffon puffed sleeves, a scooped front and back, and is decorated with hand sewn flowers. Jessica skirt has an elasticated waist and two layers of chiffon decorated with hand sewn flowers. Jessica leotard has chiffon puffed sleeves with a scooped front and back. Jessica skirt has an elasticated waist and two layers of chiffon. Girls leotards are made to order in accordance with the size charts on this page.